"My name is Alicia Bracale Nyer. 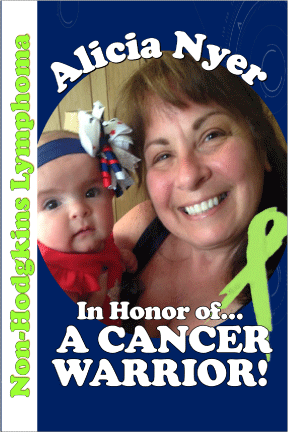 I was diagnosed at the age of 22 with Non-Hodgkins Lymphoma. After being treated at Penn State Hershey, I beat cancer and achieved remission. The support I received from family and friends carried me through this difficult time. I went on and have been blessed with two wonderful sons and a beautiful granddaughter. Life is good!!! Please support Cancer research at Penn State Hershey Medical Center."